We provide professional pond cleaning services that really take care of every part of your pond system and can easily incorporate pond repairs and maintenance if required. Regular cleaning really makes the most of your garden pond and gives fish, plants and other animals the best possible habitat to thrive in; an ideal service for business properties and commercial gardens throughout London and Surrey! For all your pond filters, equipment and cleaning services, speak to the experts here at Egmont. We have specialists in ponds and taking care of your new instalment. Call us today on 07966 142499 to go through your own pond filters or pond cleaning requirements with our professionals. Someone will be on hand to provide you with the information you need on our range of services. A clean and healthy pond environment is best for fish, plants and other animal life and the only way to do this is through regular cleaning. 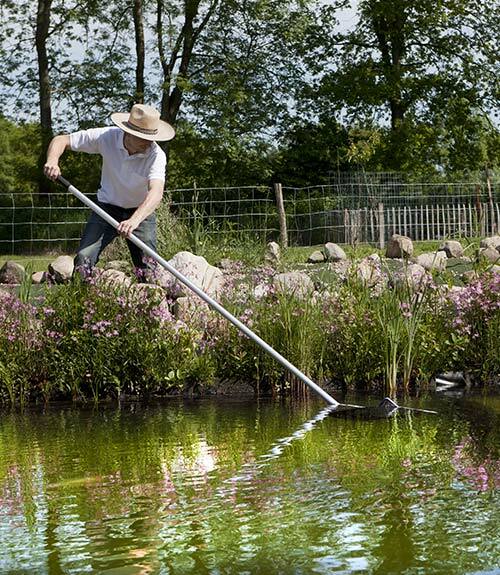 While ensuring that your pond looks beautiful at all times, our highly skilled and experienced cleaning operatives will ensure that all pumps and pond filters are clean, unblocked and providing your pond or water garden with an effective service. When cleaning any pond, we always provide a specialist holding tank, which can cater for garden ponds ranging from 50 to 2,000 gallons. These holding tanks are large enough to hold Koi carp comfortably and ensure that your fish are relaxed and stress free during the cleaning process. Once we have safely transferred your fish to the holding tank, we will begin the main stage of the cleaning process. Using a specialist high powered water jet, we will efficiently clean your tank until all moss, grime and dirt has gone. We will also dismantle and clean your pumps and pond filters to make sure that water will flow correctly. We offer the complete pond cleaning package to ensure everything is looking and working at its best for a long time. The benefits of this service are that it ensures that your pond operates efficiently and it prevents costly breakdowns due to blockages of the system. Once the jet wash procedure has been completed, we will safely transfer your fish back into their newly cleaned and much healthier pond. Like our pond maintenance programme, our pond cleaning and pond filter cleaning service is entirely bespoke and we will tailor our service to meet your needs. If you want us to visit your property every month or every few months, we will do just that. Whenever we schedule in pond cleaning we always take nature into account; natural ponds and artificial ones require different approaches, and if you have wildlife such as frogs or newts spawning times and other factors should always be considered; we consider the complete health of your pond! Based in Surbiton, Surrey, we provide our pond cleaning services to customers across London and Surrey, including Surbiton, Kingston, Twickenham, Richmond, Wandsworth, Chelsea, Hampton, Oxshott, Fulham, Wimbledon, Sutton, Chessington and Cobham. So, if your pond is looking the worse for wear and you can hardly see your fish for algae and moss, speak to the pond cleaning experts here at Egmont Water Garden Services.